Yesterday I walked through our frozen back yard to check out the forsythia bushes hoping to find a branch of fat buds that I could bring indoors and force to bloom … nothing. Though, surprisingly I found healthy green leaves covering the strawberry vines that are in a protected bed. 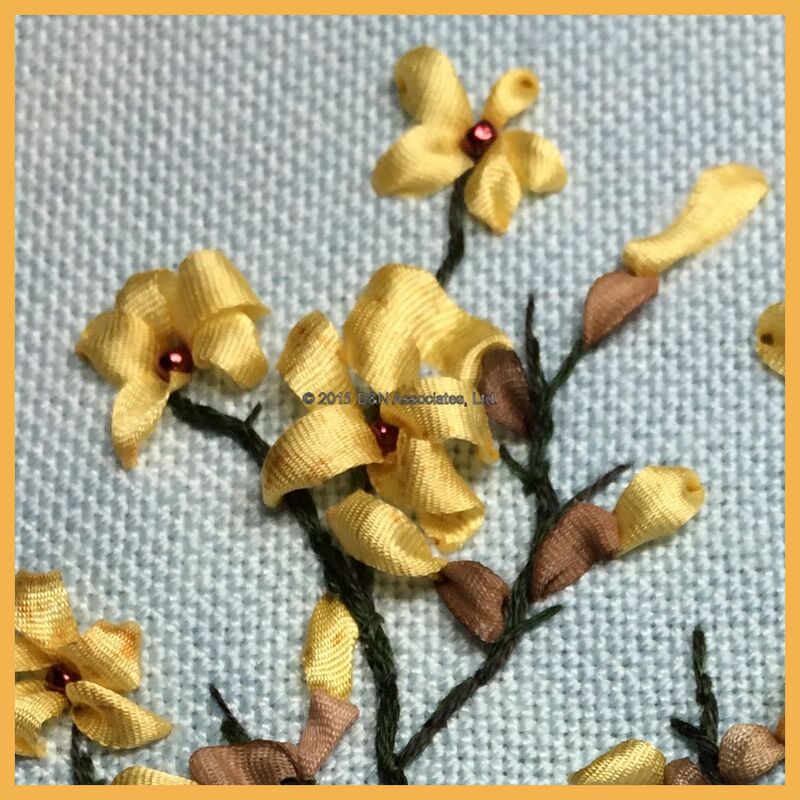 Back indoors, browsing through Ann Cox’s A-Z of Silk Ribbon Flowers book I found her Jasminum design with it’s cheery burst of yellow winter blooming flowers. 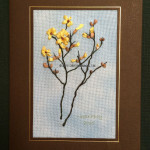 I sought to create a spray of branches, outdoors, where the main Jasmine bush hasn’t quite formed buds yet but that a few branches are getting a good steady douse of winter sunlight and were ready to burst into bloom on a lovely, sunny winter’s day. I think the blue-white color fabric has the look of a wintry sky. Fabric is 28 Count Blueberry Jobelan Evenweave Fabric by Wichelt Hand Dyed Jobelan from Wichelt Imports. 51% Cotton and 49% Rayon/Modal, purchased from 123stitch.com. 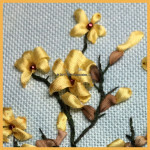 The yellow silk ribbon is 4mm Silk River color 268 which has speckles of rusty-red throughout the ribbon. I am hoping you can see what I mean by the speckles within this closeup. 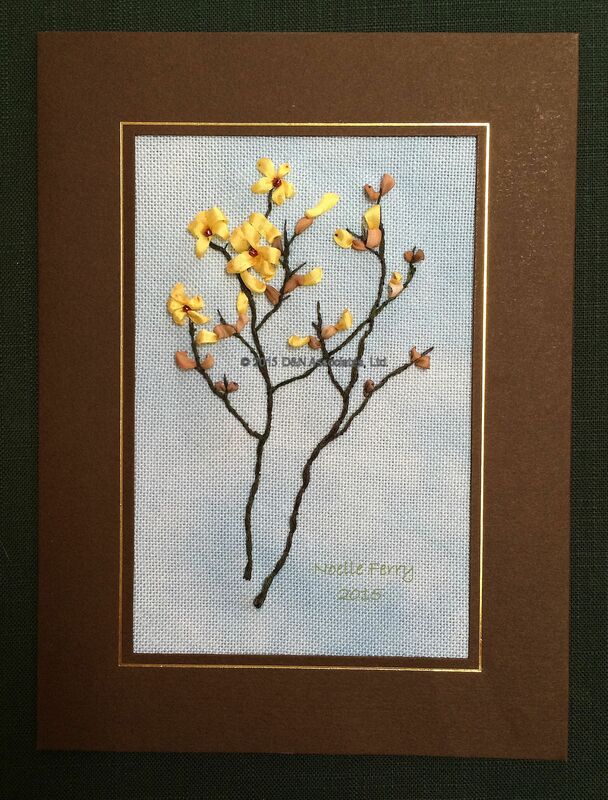 The brown bottoms of the buds is a 2mm silk beige-brown ribbon which I painted with green-yellow-purple colors. The stems are 6 strands of a dark spruce green (four strands) and dark charcoal (two strands). Beads within the flowers are a dark ruby red. The window opening of the brown card is 6 by 4 inches.